Mr. Robert Grillo has more than 20 years of leadership experience in information technology services, including executive management, strategic consulting, and project management. 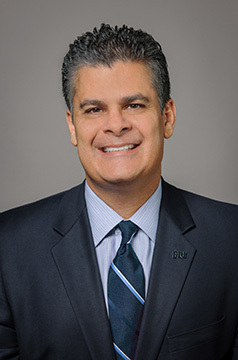 Mr. Grillo took office as the Vice President of Information Technology and Chief Information Officer at Florida International University on June 2011. In this position, Mr. Grillo leads a division of more than 250 information technology professionals. Prior to his appointment as Vice President of Information Technology and Chief Information Officer, Mr. Grillo was the Assistant Vice President for the Division of Information Technology. Mr. Grillo began his career in FIU in 2003 when he was hired to manage and lead the enterprise-wide Financial Management Systems implementation and subsequently in 2004, became responsible for implementing the Student Administration system. Prior to coming to FIU, Mr. Grillo led the consulting division for PeopleSoft Latin America and the Caribbean region and also worked for Andersen Consulting LLP (currently known as Accenture) as a senior consultant for Fortune 500 companies. Mr. Grillo is the 2013 winner of the Education category of the South Florida Digital Alliance Awards. In 2014, under Robert’s leadership, the Division was awarded the Center for Digital Government’s Cybersecurity Leadership and Innovation Award in the Education Category. He has been featured in Hispanic Executive for his work with Business Intelligence and mobile technologies. In 2017, he was awarded the South Florida Business Journal’s Technology Awards CIO Finalist in the medium company category. This program honors chief information officers who lead their organizations in delivering business value and innovative use of IT in the private and public company sector. He was also named the 2017 CIO Honoree for Miami Dade by the South Florida Business & Wealth Magazine’s Apogee Awards. The Apogee Awards is a program that recognizes distinguished leaders who hold positions in the C-Suite of companies. Additionally in 2017 and most recently in 2018, he was recognized by the Hispanic IT Executive Council (HITEC) as the top 100 most influential and notable Hispanic Professionals in the Information Technology Industry. implementation of an institutional-wide Business Intelligence & Analytics application to address institutional reporting, business intelligence and analytics. as Co-Principal Investigator and in partnership with New America, facilitated a $1.25 million award to FIU by the U.S. Department of Commerce’s National Institute of Standards and Technology (NIST) to host the National Initiative for Cybersecurity Education (NICE) for five years. Mr. Grillo holds a Bachelor’s from Florida International University and a Masters in Finance from Nova Southeastern University. The Division of Information Technology (IT) is Florida International University’s central technology service provider and is led under the direction of Mr. Robert Grillo, Vice President and Chief Information Officer.